Wire Rope Eye Splice — John Murray Productions, Inc.
Theses 1/8" wire rope eye splices were rejected by JMP. #1 No Thimble. 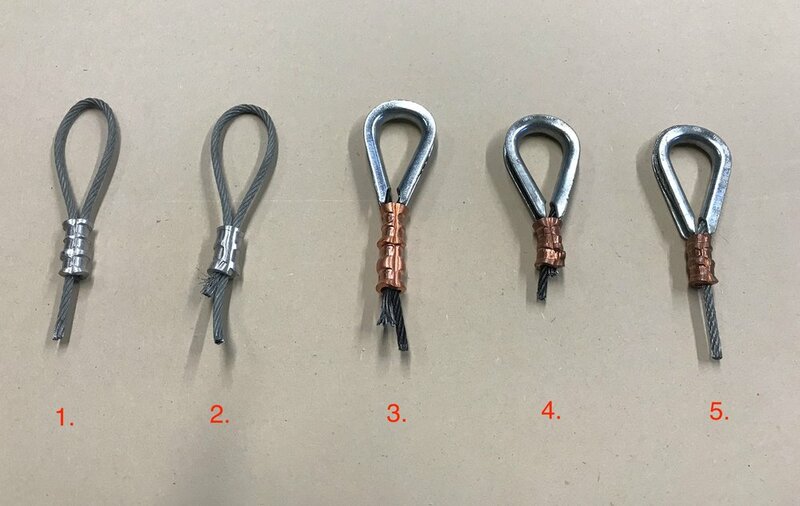 Though not required in all situations, it is JMP's practice to always use a thimble with wire rope eye splices. We also only use copper sleeves with galvanized cable. #2 Incorrect Crimping- In addition to not having a thimble, this eye has only two crimps on the sleeve. Our hand crimping tool for 1/8" wire rope requires 3 crimps on the oval sleeve. #3 Two sleeves and both are improperly crimped. #4 Crimping does not pass the gauge inspection. Always check your crimps with a "Go Gauge." #5 No visible tail. Always leave a small tail exposed past the end of the crimped sleeve. If you cannot see the tail then you can't be confident that crimps are properly placed over both legs of the wire. Only use the best quality crimping tool and follow the manufacturers instructions. For field use, we use a Nicropress 64-CGMP hand press. Make certain you use the correct sleeves and stops with your wire rope. Use only the sleeves that are specified by your tool. Crimp order is important.- When using a thimble in an eye splice, Nicopress recommends placing the first crimp on the end of the sleeve closest to the thimble. In our 1/8" eye splice example, the second crimp is in the middle and the third crimp at the end away from the eye. Nicopress always advises: never crimp between two previous crimps. When in doubt, ask. Consult with a certified rigger or call your tool's manufacturer.